At the end of the last semester, Sigma Alpha Epsilon was placed on suspension by the MIT administration. 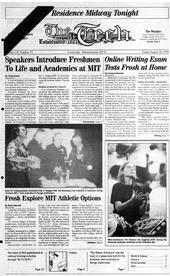 For the events which caused this action and the detrimental effect which they had on the reputation of MIT and its FSILGs, we would like to apologize. As the term came to a close last year, the brothers of SAE examined our attitudes towards MIT and our fellow students. We have realized that with the environment in which we live being so closely watched by outsiders, fraternity members and indeed all students must present themselves in the best manner possible. For this reason, we decided to make many changes within our house, which would have positive effects not only on our own behaviors and attitudes, but on MIT students as a whole. With the strong support we have found from our alumni, we believe that the changes which have begun this summer will continue throughout the year. This fall we plan to hold several events on campus aimed at bettering student life. Realizing that this is a time for control and moderation, we have chosen to be alcohol free. This was in fact sanctioned by the Interfraternity Council last fall, but SAE plans to remain dry past the June 11 deadline set by the IFC. We had hoped to have had our suspension lifted in time to hold rush events. Earlier this summer, we were led to believe that because of the programs installed by our alumni and the changes occurring within our brotherhood, this would likely happen. Our pledge program has been reorganized in order to focus on building true gentlemen, good students, and campus leaders. Due to incidents at other fraternities in the past months, we have been informed it will not be possible to have the suspension lifted before the upcoming rush weekend. We still view our pledge program to be a vital part of the new house that we are trying to create. Therefore, we will be doing all that we can to have the suspension lifted by the second term, at which time we may extend bids and invite freshman to live with us. The rules have certainly changed for MIT FSILGs. We at Sigma Alpha Epsilon are making changes to fit these new rules. We sincerely hope that other houses can observe the things that have occurred at our house, and learn the same lessons that we have so that the fraternity system can survive and retain its strong tradition at MIT. We appreciate the positive support that the IFC has given us. We look forward to the events we have planned for this fall and to meeting the freshman class.